Is Your Kitchen Poorly Stocked? Give Yourself a Nutri Ninja! I believe that I have the worst stocked kitchen in the way of utensils and gadgets of anyone I know! When we have family dinners, my adult children often make comments, such as “Mom, don’t you have any sharp knives” or “are these the only measuring spoons and cups you have”? I really began to realize how much easier it would make food preparation if I had the right tools! So I made the decision to improve my kitchen stock. I purchased some new measuring cups and spoons, some spatulas and a nice knife as a start. 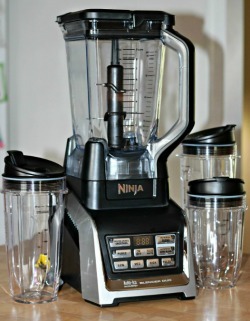 Then I was actually given a Nutri Ninja/Ninja Blender with Auto-IQ! I was very excited for the opportunity to try it. I had been considering such a purchase in the hopes that it would encourage me to make healthy drinks and smoothies. When I opened the box I found the Nutri Ninja base, a 72 ounce pitcher and 18, 24 and 32 ounce Ninja cups with sip & seal lids. I wanted to try it out right away so after removing everything from the box I looked through the recipe book, picked out a healthy drink to try and headed for the grocery store to find the ingredients. The Lean Green Ninja was destined to be my first drink experience! Place all of the ingredients in the regular 24-ounce Ninja cup in the order listed above, starting with the pineapple. 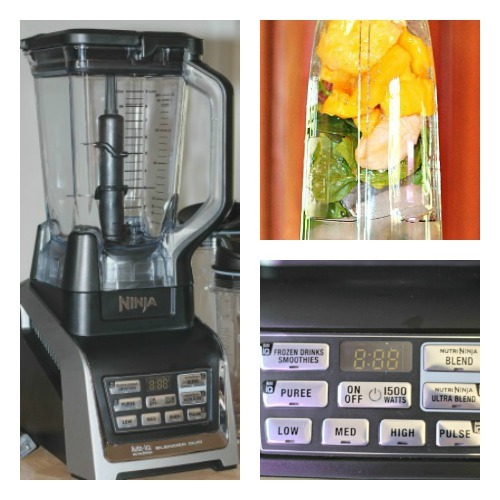 Turn unit ON and select the “Nutri Ninja Auto IQ” blend program. The recipe was quick and easy except for, and I think several of you will agree, cutting the mango! I haven’t quite mastered that yet! I placed my ingredients into the cup as instructed and placed the Pro Extractor Blade lid on and inserted it into the top of the motor base. I turned it on and chose the auto-IQ blend button as instructed. The Ninja does the rest and I love that! I didn’t have to manually stop and start it or press the pulse to make sure everything was blended, the Ninja is programmed to do those things on it’s own. Nutri Ninja and Lean Green Ninja ingredients ready to blend! The finished drink was very good. Not only did I like it, but I shared with Paul and my mother (who was visiting at the time) and both of them really liked it as well. There was one family member that was not happy with the Ninja and that was our collie, Gunnar. He wasn’t sure what this new thing was and very loudly let us know that something was up that he wasn’t accustomed to! I then moved on to my next drink recipe, an “antioxidant refresher”. It too was good, but in our house we agreed the Lean Green Ninja got first place. My next adventure is going to be to make the Kale and Sunflower Pesto. I love pesto and this sounds like a nice variation. You will get all of these recipes and more when you purchase your Nutri Ninja and blender combination. You can find cheaper machines, but not with the quality. I think my reason for never continuing to work with a blender was that I had purchased the inexpensive ones and was always disappointed with what they could do. My last adventure, prior to the Ninja, was an attempt to crush cranberries for a Christmas salad. It did not work well at all and that blender eventually moved on to the thrift store donation box! I am very happy with the Nutri Ninja Blender. Everything comes apart very easily for clean-up and I love the idea of blending my healthy drink right in the same cup I can sip it out of. Just remove it from the base, take off the blades, put a sip & seal lid on and out the door you go!